Every morning I get an affirmation from Abraham Hicks, and this morning’s was this: The only thing that makes the difference in the way you feel right now is the thought that you are thinking right now. That was pretty interesting because moments before I was thinking about having to go back to the Cancer Center on Tuesday for my 11th Herceptin infusion. Obviously, I’m really not happy about that, especially because I have been feeling so good for the last week. I started to think about trying to think about my treatment in a different way. Even though it might make me feel bad, the purpose is to help make sure I never have a recurrence – and that’s very good. On the other hand, it would be false to just try and walk around with a PollyAnna positive attitude about it – because the truth is, it makes me unhappy. So, from now on, I’m choosing to put the remainder of my treatment in a more neutral thought zone, as in: it’s not horrible and it’s not great. It’s not good or bad. It just IS. I’m sure you’ve all heard this fable but it’s a good one (oops – it just IS a story) and it’s a good reminder. You get the point. I get the point. I have a choice in every moment as to what I choose to think about and how I choose to think about it. On that note, I hope you won’t mind if I write about something besides cancer now and again. I was even thinking of changing the name of this blog, but it’s linked to too many other things now, and maybe it will help someone else down the line. I might have to end this one when my treatment ends. Perhaps I’ll start another blog. If I do, I hope you’ll join me. For now, my treatment continues, some side effects remain, decisions may change. It isn’t good or bad. It just IS. The day before, during and for three days after you have an infusion, they put you on steroids. It’s a great way to fight nausea; it makes you feel good, and it gives you energy. It also makes you ab-rav for carbs. All I want is pancakes, french toast, bagels, pasta, br ead, brown rice, cookies, you name it. It doesn’t hurt that its been about 15 degrees or colder for the past two weeks. Or that I’m wearing sweatpants most of the time. Well, I reckon if there were ever a time to give myself permission to enjoy a few carb-indulgences, this would be it. That being said, there have been a lot of studies published recently, and pretty good science that indicates that cancer loves sugar. Before I was diagnosed, I had pretty much weaned myself down to only eating good dark chocolate, So, I’m planning on going back to that once the cancer-killing chemicals are out of my body. And until then, I don’t plan on going completely nuts. ALthough, I can’t say I won’t be going completely without chocolate-covered raisins. Regardless, by next Easter, I plan to be able to fit a Cadbury egg in the boney space in my neck, just like Robin Penn Wright. The American Cancer Society has some pretty great programs for those of us going through this “mishahgos”*. Today, I participated in one called “Look Good. Feel Better.” Granted, it is not the most feminist of events, but when your pale, and dry, and brow-less, puffy-faced, and feeling a little like a porker, it’s good to empower women to look good and feel better by using make-up. Granted, I know my way around the cosmetic counter, so for me, it was a little like teaching Esther Williams to swim. 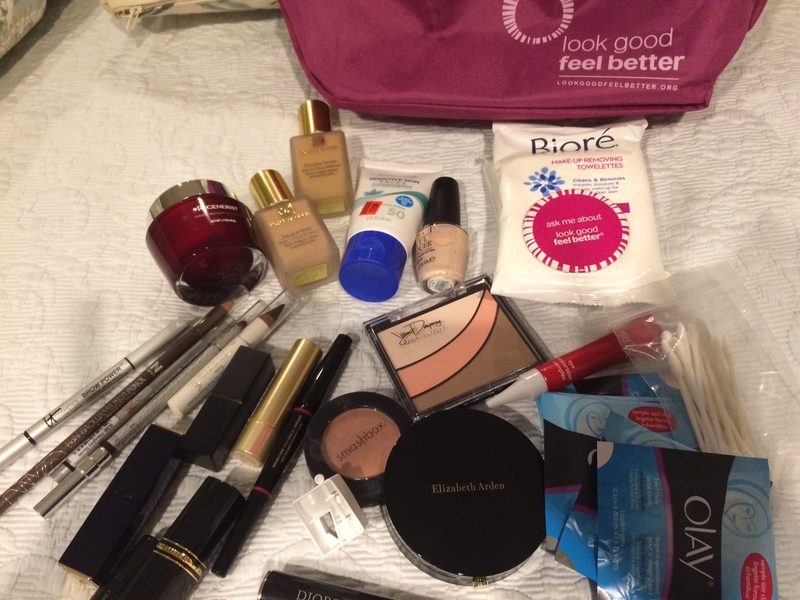 But I met some terrific warrior goddesses who are also trying to put their best face forward, and the best part was the amazing swag bag we all received, filled with products from Avon, Dior, Estee Lauder, and more. And who doesn’t like swag. Mr. Demille, With my make-up and turban, I might actually be ready for my close-up . *Mish-ah-gos – yiddish for the crazy stuff. There’s a lot of good news about breast cancer. Survival rates are up. Treatment is more tolerable. Diagnoses are down. More targeted therapies are available, and those found with Stage 1 have a relative 5-year survival rate of 100%. That’s all good stuff, unless you are 1 of the 40,000 women who will die this year from the disease. 40,000?? That’s 40,000 too many. That’s the equivalent of the 3 jumbo jets crash landing every week for a year. But think about it. If 3 commercial airliners went down every week with no survivors, I think people would stop flying. My point here is that when it comes to breast cancers (and many other cancers), people over 40 can do an awful lot for themselves to avoid getting it. I’ve learned that there are pretty specific ways to really lower your risk. I am sure I’d heard all of these before but of course, no one thinks it’s going to happen to them. And yes, one of my horses has gotten out, but I’m certainly ready to close the barn door now. So, how do you avoid buying a ticket to Cancer Town? First off, being overweight is one of the factors, and the heavier you are, the greater the risk. It’s pretty sad that 69% of our population is overweight or obese. Which brings us to the next piece of the prevention pie: eating a healthy diet with an emphasis on plant-based foods. Even limiting processed and red meat can make a big difference. Next up: alcohol. Sorry, but no more than one drink per day for women, and two for men is recommended. Some say its best to avoid it altogether. And lastly, being physically active is critical. That means getting 150 minutes of moderate exercise each week, which boils down to 20 minutes per day. I almost forgot because it kind of goes with saying: stop smoking. Smoking is linked to all kinds of cancer now, but 85% of lung cancer deaths would be avoided if people would just…stop…smoking! Well, I have to say, I was not a fat, booze drinking, chain-smoking, burger-stuffing couch potato by any means. But if I had thought about it, I think I could have made a number of lifestyle changes to decrease my chances of getting this disease. I would have started long before I was 40. I certainly will now. I hope you will, too. I could use a couple of la-dee-dahs. One to Go. Pass the cookies.